9 years ago, when my first born was about 1 ½ years old, I forced myself to take a long hard look in the mirror. I was just skimming through life, trying to be the best mom, but felt like I was failing. It wasn’t that I was a bad mom… I gave my daughter everything she could ever want and loved her unconditionally, I wasn’t happy myself. I felt ashamed of who I had become from having a baby, packing around all this extra weight, and in return showed myself no self-love. It was then and there that I made a pact with myself to put myself first. I knew that If I did that, I could become a better mom, wife, daughter and all around better person! I had heard about P90X from an infomercial and decided to give that a try – I was hooked! I was obsessed with how working out made me feel, and for the first time since I could remember, I started looking at myself with love. I loved who I had become. I loved that I had such an amazing and healthy daughter, the most supportive husband, and a strong and healthy body! Since that day over 9 years ago, I have decided to put myself first – I deserved it! Fast forward to the day I heard about 80 Day Obsession in 2017. 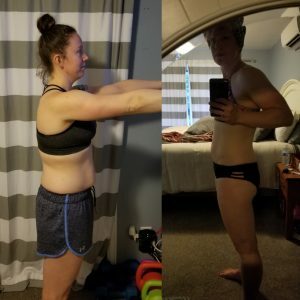 I had never actually done any workout with Autumn, but from what I saw, I knew this program was for me. At that time, I was feeling a bit stuck. I had been working religiously but was at a plateau. I was doing the moves, but the thing I lacked the most was a healthy diet. Although I had done multiple workouts, I never once decided to go forward with the nutrition. For me, it was a scary concept. I was an addict to sugar, and I knew if I went 100% in with the nutrition, I wouldn’t be able to have my sugar lifeline. Once January came, I decided to go all in with the workout and nutrition. I knew if I could kick the addiction, I would be in a better place. I wanted to prove to myself that I could do anything I set my mind to! 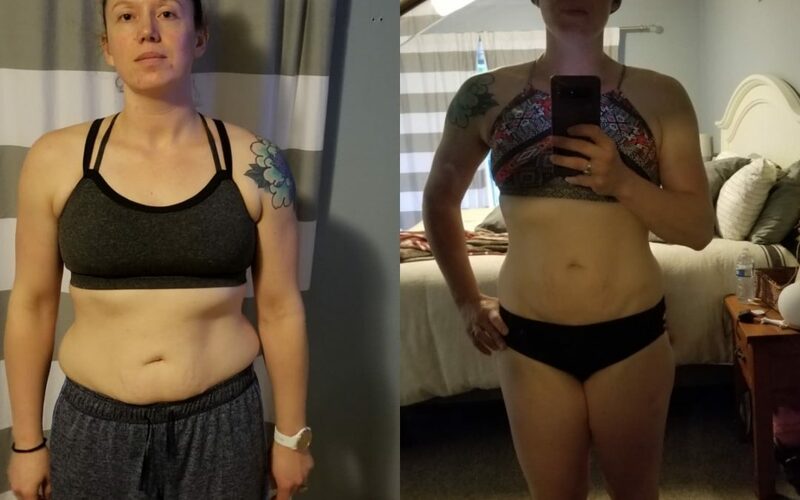 Let me just tell you – that one scary change turned out to be the best thing I have ever done for myself (besides working out of course!). I felt like a weight was lifted! 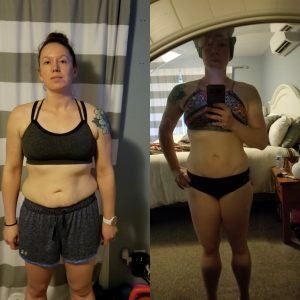 Throughout the entire 80 days of the program, I stuck to the nutrition 100%. I had never felt so good in my entire life! It wasn’t just what you could see from the outside, but I was radiating from the inside as well! 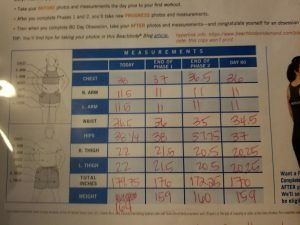 During my 80 day journey, I ended up losing 9.75” and 5 lbs! It wasn’t about the weight or inches for me, but the freedom that it gave me that made me a believer in the entire process! I can’t believe it took me over 9 years to finally go all in, but I’m glad I finally took the plunge! – It’s never too late! In fact, since finishing the first round of 80 day obsession, I decided to go all in once more, and am finishing up round 2 this week! 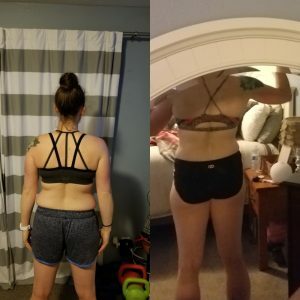 Since plunging into the first round of 80 Day Obsession I have come to love fitness and nutrition more than I ever thought was possible! I have since turned my commitment into a lifestyle, making healthier choices for myself, as well as setting a good example for my children in hopes they will continue to make healthier choices and live a more fulfilling life. Although those two rounds are over for me, my story is not done. Who knows what the future holds – but at least I will be a healthier and better version of myself while figuring out my next move!